This is a tutorial on painting a water drop. I’m using Paint Shop Pro 8 here, but this will work in just about any paint program. 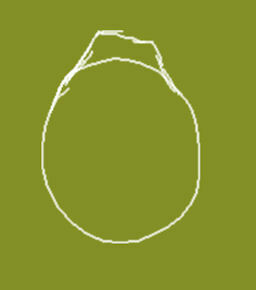 Okay, create a new image, 512×512, and fill it with a nice leafy green. Create a new layer and name it “outline,” make it active. 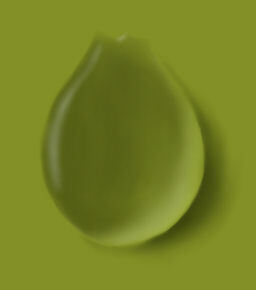 Select your paintbrush, set the foreground color to white, and draw your water drop shape. Now, determine which side your light source is coming from. In this case, it is coming from the left side. Create a new layer and make it active. You can do this next part freehand or use your freehand selection tool to select the water drop area so that you don’t go outside the outline. 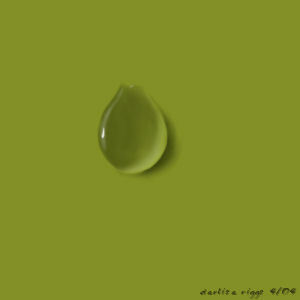 Select a darker green than the background and shade the side of the drop that is closest to the light source, with the far edge darkest and fading towards the other side. Use either the paint tool or the airbrush tool. Note: Whatever color you are using as your background, the shading will be a darker shade of that color. Select a light yellowish green and using your airbrush, paint along the bottom edge of the drop, opposite the light source. The color should fade towards the darker green area. Again, if using a different color background, change the lighter shading color appropriately. Merge the last two layers (in PSP8, hide all layers except the last two, select one of them, then choose Layers : Merge : Visible). On the drop layer, use your smudge and soften tools to blend the edges of the dark green and yellow green. Hide the outline layer to get it out of the way. If you weren’t using a selection, this might be a good time to clean up the edges around the water drop on the drop layer. If using a selection around the drop, invert the selection now to select the area around the drop. Select a darker shade of green than the one you used for the shading on the water drop. If using a selection, invert the selection now to select the water drop area again. Switch to your airbrush and select a light blue color. Paint in a highlight going down the left side of the drop (or whatever side your light source is coming from). Use your soften tool to soften it just a bit and smooth out the edges. 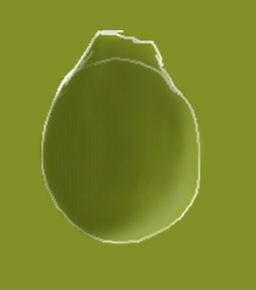 Change your foreground color to white and paint a small highlight along the edge of the drop. There, now ain’t that purty?